The first volume focused on king’s pawn openings and the second investigated queen’s pawn openings and the structures to which they lead. This third volume covers the English Opening and related structures. 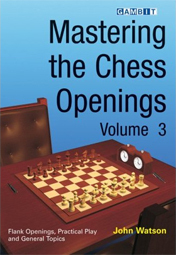 The author also promises a fourth volume “devoted to a selection of the remaining chess openings,” including subjects such as choosing an opening, opening preparation, and how to study openings. Watson states that the English is “wonderful grounds for the study of positional ideas that encompass the entire range of chess practice.” He discusses the ideas and principles of play from the very first moves “in order to explain the elementary properties of the English Opening” and notes that the opening lends itself to a “broader conceptual approach” that allows for an increased role of verbal explanation. The publication of this series is a bellwether event in chess publishing, and all players should avail themselves of the opportunity to read these books. You can download a PDF file with a sample from the book from the Gambit website.